We’ve recently released a beta update of FDT (v. 3.1.1. 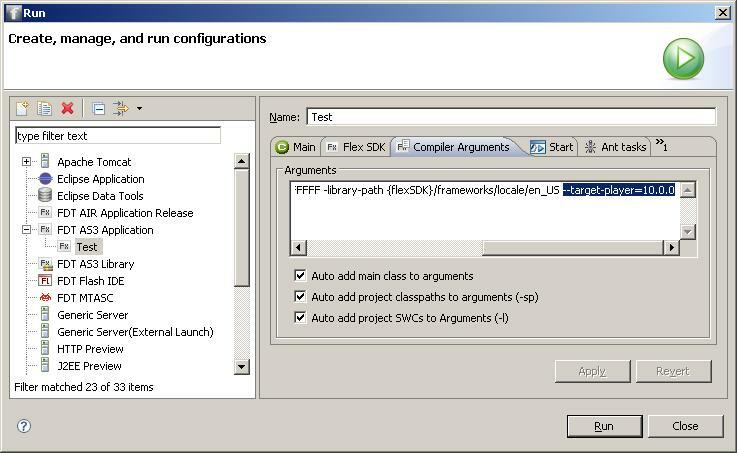 Build 1017) which fully supports Flash Player 10 projects and the new Vector.<Type> Syntax. Here are the few steps you need to follow, in order to create Flash Player 10 content. Click “Folder” and select the downloaded and decompressed Flex SDK folder. Create a new Flash Project in FDT and select AS3_FP10_beta in the Project Language section. If you have used the Flex SDK 4, everything should work fine. If you have used the Flex SDK 3.2 you will get a Compile Error. This is because the Flex SDK 3.2 compiles SWFs for Flash Player 9 by default. flex_sdk_3.2.0.3794/frameworks/flex-config.xml you can see, that it uses Flash Player 9 as target player <target-player>9.0.124</target-player>. The flex-config.xml of the Flex SDK 4 uses Flash Player 10 as target player, so you don’t have to add this compiler argument. to quickly create new variables of type Vector. Is this no longer valid? I downloaded FDT recently and there were options for FP 10 export. Am I missing something?